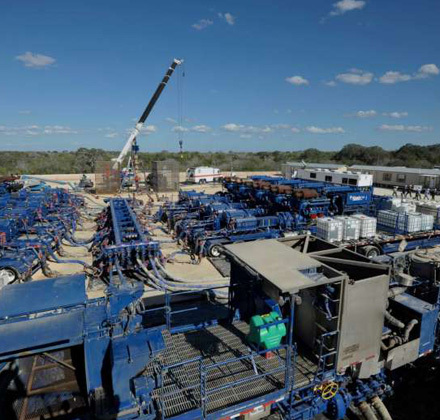 Hydraulic fracturing is the main measure for increasing oil and gas injection in oil and gas fields. In recent years, due to the foreign monopoly of guar gum, leading to the supply tension in international market which affect the progress of fracturing. Moreover prices of guar gum rose sharply, resulting in a substantial increase in the cost of fracturing. In order to solve the above problems, it is necessary to develop a new type of fracturing fluid to replace the guar gum system fracturing fluid for the geological characteristics of the oil field, so as to reduce the cost of fracturing and ensure the smooth construction of fracturing. Polyacrylamide is often used to carry out oil displacement and profile control and water shutoff. The gelation performance is similar to that of guar gum and the cost is relatively lower. Therefore, it is of great practical value to develop the formulation of polyacrylamide fracturing fluid. Polyacrylamide fracturing fluid has been used widely in oil field due to its advantage of small friction, no residue after breaking the plastic, damage to the advantages of small oil and gas. The oil field that Sinofloc serviced for was used to determine the molecular weight of polyacrylamide by measuring the time of gelation and the strength of gelatin. According to the requirements of different stages of fracturing fluid performance, considering the effect of temperature, the influencing factors of polyacrylamide were determined, like time, gel strength and other indicators, screening cross-linking agent. By measuring the breaking time, breaking the residue after the residue, screening the breaker, and optimize the concentration of breaker, and the addition of activators or inhibitors to control the process of breaking gel. And then consider the effect of clay stabilizer, anti-emulsifier, auxiliary agent and filter-reducing agent on fracturing, and optimize the concentration and evaluate the performance of fracturing fluid. Through the Sinofloc’s laboratory experiment, considering the different performance requirements of fracturing fluid in different stages, by determining the time and strength of the gel method to optimize the molecular weight of polyacrylamide, the type of cross-linking agent and its concentration ratio formed The basic formula for fracturing fluid is. For more details on the formula please contact marketing@sinofloc.com.